(l to r): Kyle Arlington, Assistant Superintendent of Millburn Schools, Ms. Jessica Purpura, Ms. Monica deFalco, and MHS Science Department Chair, Gina Cocchiaro. MILLBURN, NJ – The Millburn Board of Education welcomed a group of the district’s high school science teachers to the meeting Monday evening to discuss changes to the ninth grade curriculum. 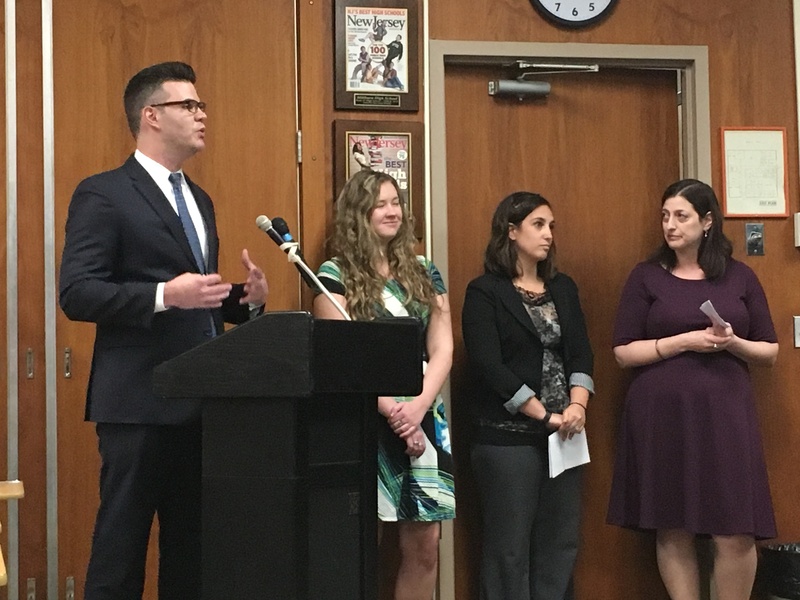 Mrs. Elinore Begala-Gordon, Ms. Anna Croce, Ms. Monica DeFalco, and Ms. Jessica Purpura of the Millburn High School Science Department’s Professional Learning Community (PLC) presented their routes, function, and future objectives to the Board and the public. Peer review of the current curriculum highlighted a deficiency in the ninth grade physical science program, better known as Introduction to Chemistry and Physics. The program failed to support the Next Generation Science Standards (NGSS) model. The team quickly embarked on the mission to update the ninth grade syllabus to prepare the students better for higher-level scientific disciplines. “We knew we needed more earth science,” said Croce. “This will help the students’ understanding in other courses.” The teachers believe that the intro-level physical science classes develop an understanding that each scientific discipline connects to others. The goal is to remold students’ thinking and enable them to connect the dots between the different sciences and apply the same laws to each subject. In order to foster scientific thinking, the group believes technology should be incorporated into the curriculum. Online textbooks and FlexBooks, customizable digital textbooks are all elements the teachers want integrated into the future program. The teachers also believe the increase in earth science will call for the freshman to research current issues, using their school-issued Chromebooks. Mr. Kyle Arlington, Assistant Superintendent of Millburn Schools, praised the science PLC in response to its flexibility and versatility and covering a wide array of issues within science education at MHS. “I was really excited to present this PLC because I think it shows that the group focussed their spotlight on the problem, then wisely moved their focus around, thereby illuminating other problems,” said Arlington. Subsequent Board meetings, including next week’s Program Committee meeting, will iron out details regarding content and move closer to an updated Introduction to Chemistry and Physics.